LaSalle’s fire chief is praising the teamwork that went into battling a large fire overnight on Fighting Island in the Detroit River. 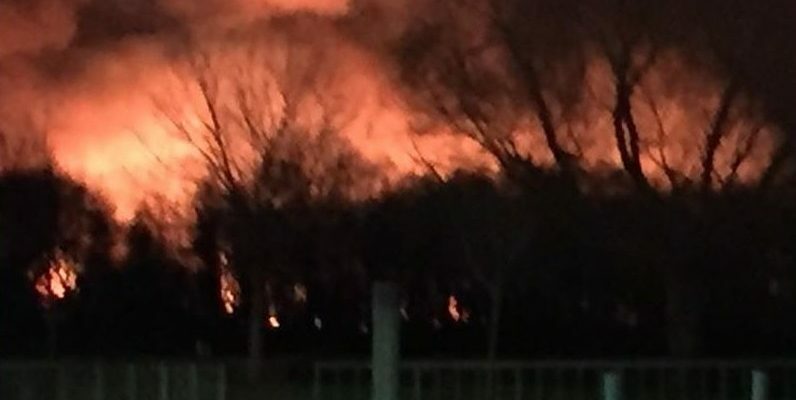 Fire officials received a call about the marsh fire on the island around 8:30 p.m. Saturday evening. The flames started on the northeast end of the island and the wind caused the fire to move south. J&J Marine assisted by transporting a fire truck and equipment to the island. Amherstburg Fire was called in to assist and Windsor Fire assisted with fire protection coverage in LaSalle. At the peak time of the fire, there were 30 firefighters on the island. Town officials said no one hurt, and a group of hunting dogs on Fighting Island are unharmed. Structures on the island have not been damaged, but it is estimated that 250- to 300-acres of vegetation was damaged. During the fire, officials assured residents that the fire posed no threat to community safety, and that there was no concern regarding toxicity in the air. Flames could be seen from miles away as curious residents gathered across the town to catch a glimpse of what was going on. People were asked to remain a safe distance away from the riverfront as emergency vehicles gained access to the scene. Sutton is thanking members of the community for their support during the night as well. “It was certainly a spectacular viewing event. We had a large portion of the community, I think, that came out to view the fire from our side of the river. We did have a lot of support, especially in the community as well,” he said. Fighting Island is a 1,500-acre island owned by BASF, a German chemical company that uses the land for various programs to teach Essex-County elementary and high school students about ecology. Sutton said it was too earlier to give an exact dollar amount on the damage to the company’s property. The fire was completely extinguished shortly before 5 a.m. Sunday morning. Sutton said in recent memory, this is one of the larger fires, in terms of size, that the area has seen in a while. Sutton said they do not have a definitive cause yet for the fire yet and it continues to be investigated, which may take a while due to the large amount of land that the flames swept through. Although he said it is currently being ruled as accidental.